Documents will never leave your facility! We offer "on-site" scanning for short-term scanning projects. As little as a half hour or as long as 1 year of scanning, Bosscan has spent this and every amount of time in between at customers' facilities. We bring and use our own scanners and equipment, and we only require an adequate space and environment to setup. 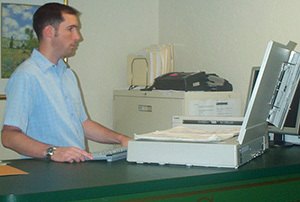 Our process includes a 10-15 minute setup before we are ready to begin preparing documents for scanning. Once the scanning is complete, the original documents are placed back in the original order within the original drawer(s) or box(es), re-stapled if required. The scanned images can then be taken back to our office for post-processing. Your images can then be placed onto your company's server, put on a USB device, CD or DVD, or uploaded to a records management system. We also can maintain a copy of the data for backup purposes, upon your request. All PC's are password protected and a Bosscan representative monitors all PC's throughout the project. Once receipt of the scanned data is verified, PDF/TIF images are scrubbed from Bosscan computers. Production style, high speed scanning equipment provides image quality as good as or better than the original document. Various scanners ensure we will have the right equipment for the job. Managed and staffed by experienced Bosscan employees. Friendly, professional, well trained scanning staff. Scanning knowledge: File size/type, color and black/white scanning. No need to spend countless hours scanning a handful of documents. Let Bosscan do the work in half the time. On demand priority projects never a problem. Call 781-245-1050 today and let us work with you to find the best solution!